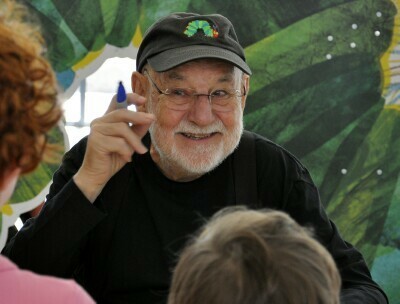 With over 132 million copies of his books sold, including the immensely popular The Very Hungry Caterpillar, honorary degrees bestowed upon him, and numerous awards for his work, Eric Carle chooses to downplay his own talent and focus on those who have helped him become one of the world's most-beloved children's book illustrators. "I feel very grateful for many things -- being able to do the artistic work I love and to have had numerous, generous 'door openers' in my life -- people who have helped me to find my true course." Born in Syracuse, New York, Carle's parents moved back to Germany when he was a child. Adjusting to the move was difficult for the young Carle. "I started first grade twice -- once in the U.S. and once in Germany, both at the tender age of six," he says. "Two cultures, two languages, two different teaching methods." His personal experience had a lasting impact on him and his attitude towards childhood. "I am especially interested in a child's transition from home to school because this can be quite traumatic," he says. "For me, it was a particularly difficult period in my own life and I hope my books will help to make this transition easier for children." Carle had an artistic bent from an early age. "I have always loved to draw and have been making pictures ever since I was a very young child," he says. His earliest mentor was his father, who used to take Carle on nature walks through the woods as a boy, leading to a lifelong interest in nature. "He'd lift up a rock and show me the small creatures that lived underneath it," says Carle. "I think in my books, I honor my father by writing about small living things." Others saw potential in Carle as well, including his first grade teacher in Syracuse, who he calls one of the most influential and important people in his life. "Miss Frickey encouraged my creative interests at that early age and impressed upon my parents that they must nurture and encourage my talents as a visual person, which they did," he says. While living in Germany, Carle studied art and graphic design. He was taken under the wing of an instructor who ignored Nazi restrictions and bans placed on great works of art. "My brave teacher Herr Krauss, at great personal risk, secretly showed me the reproductions of paintings of modern and expressionistic art deemed 'degenerate' at that time," Carle says. "The paintings were unlike anything I had been exposed to before. This experience at first shocked me and I found it unsettling. But in the end, it changed my view of art, though I didn't know it at the time." Carle was further shaped by one Professor Schneidler, whom he studied under at the Akademie der bildenden Künste in Stuttgart. "He instilled in me the principles of design that remain true for my work today," Carle says. "Simplify and refine, be logical and harmonious." As an adult, Carle moved back to New York where he worked as a graphic designer for The New York Times and served as an art director at an advertising agency. By chance, children's author Bill Martin, Jr. saw an advertisement featuring a red lobster designed by Carle. Martin was so impressed by the colorful crustacean, he asked Carle to illustrate his latest book, Brown Bear, Brown Bear, What Do You See?. Carle, who was in his late 30s at the time, sensed the beginning of something epic. "What an inspiring book!" he recalls. "I was set on fire! It was possible, after all, to do something special that would show a child the joy to be found in books. This opportunity changed my life." Rather than drawing or painting, Carle illustrates with collage. While his work is instantly, undeniably recognized as his own, he's quick to point out that many artists have used the technique before him. "Matisse and Picasso are famous for their collages," he noted, adding that picture-book artists Leo Lionni and Ezra Jack Keats also employed the method. Carle spent much time experimenting before he perfected his signature style. "I first made collage out of painted papers in art school," he says, adding that in order to get the exact shades and tones he wanted, he created his own colored tissue paper. "Initially, I just added a few brush strokes of paint to the commercially available colored tissue papers," he explains. "Then I discovered that the commercially available tissue papers faded after some time, so now I use only unpainted tissue paper and acrylic paint in all colors." Carle's process has evolved over time. "Over the years, my painted papers have become more detailed, complex, and richer, and some have become works of art in themselves," he says. Carle's classic The Very Hungry Caterpillar, which follows the gastronomic adventures of a somewhat clumsy critter and his metamorphosis into a beautiful butterfly, has been translated into 62 languages and sold millions of copies around the world. "I didn't realize it right away, but I believe the popularity of the book, which I first published in 1969, was because it is a book about hope," says Carle. "It says you, too, little caterpillar, can grow and change into a beautiful butterfly, spread your wings, and fly off into the world." In 2002, the Eric Carle Museum of Picture Book Art opened in Amherst, Massachusetts. Among the features of this attraction are three galleries exhibiting an ever-changing collection of artwork created by picture book artists from around the world. There's also a hands-on art studio, an auditorium, and of course, a library. It has become a mecca for families and school field trips with over half a million people having passed through its doors. Carle says he and his wife Barbara were inspired to open such a place after visiting a number of picture-book museums during a trip to Japan. "We decided to create a museum in this country to encourage, especially in children and their families, an appreciation for and an understanding of the art of the picture book," he says. According to Carle, his wish for those who visit his museum is much like his wish for the audience who reads his books. "I hope my books are entertaining, interesting, and pass along some learning as well."